Rennies Coaches (“Rennies”, “we”, “us”, “our”) is a trading name of Fife Scottish Omnibuses Ltd, trading as Stagecoach East Scotland, Stagecoach in Fife, Stagecoach in Perth, Stagecoach Strathtay and Rennies Coaches. The ultimate parent company is Stagecoach Group Plc, a company registered in Scotland (Registered No. SC 100764) whose registered office is at 10 Dunkeld Road, Perth, PH1 5TW Scotland. • What type of device, model and operating system you’re using. • Assist with the verification of claims. You have the right to make a Subject Access Request for CCTV images of yourself and to ask for a copy of them. Please direct any such request to ukbus.datacontroller@stagecoachbus.com. To protect the rights of other individuals whose images may also be captured by the same images, we reserve the right to redact images. We reserve the right to withhold information where permissible by the applicable data protection legislation, and we will only retain CCTV images for a reasonable period or as long as is required by law. In certain circumstances, we may need to disclose CCTV images for legal reasons. When this is done, there is a requirement for an organisation that has received the images to adhere to the relevant data protection legislation. 1. Contract—Most of the information we collect from you is necessary to allow us to fulfil our contract with you or to enter into a contract with you e.g. you may provide a billing address when you book via our website; we may need to contact you to notify you about changes to your booking. 2. 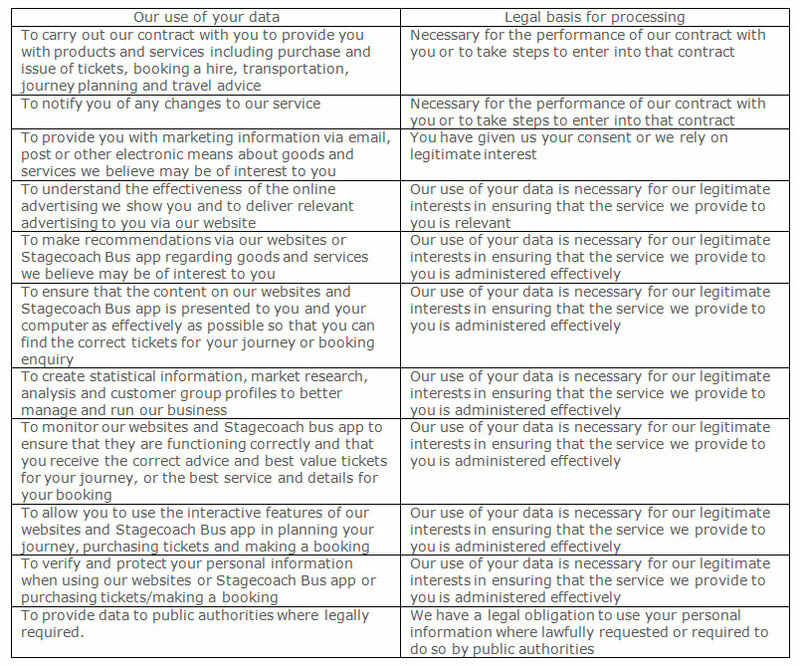 Consent—When you register and open an online account on stagecoachbus.com us you will be invited to give us your consent to use your personal information as described in ‘How we use your personal information for marketing’. By opting in you are giving us your permission to process your data using consent as our legal basis. If you have given consent to our use of your personal information, you are entitled to withdraw this consent at any time. 3. Legitimate Interests—We have a legitimate interest in using your personal information e.g. to ensure that the content on our websites and Stagecoach Bus app is presented to you and your device as effectively as possible. If this is our reason for using your personal information, we must make sure that our interests do not override yours and you can object to this use of your personal information. We also have a legitimate interest in exchanging information with other companies and organisations for the purposes of fraud protection and credit risk reduction. 4. Legal Obligation—Lastly, we have a legal obligation to use your personal information where lawfully requested or required to do so by public authorities. Where you’ve given us permission to do so, we use some of your personal information for marketing. For example, we may use information like name, address, location and past bookings to ensure we make our marketing relevant, accurate, and measure its effectiveness. If you have given us your consent to use your personal information for marketing, you have the right to withdraw your consent at any time by contacting our Data Controller on 0161 880 5000, clicking the “unsubscribe” link in our marketing. You can also contact us via the form on Rennies.co.uk at anytime to request an update to your marketing opt-in. Rennies Coaches may share your information within companies within the Stagecoach Group. We do not share or sell your personal information to any other company for marketing purposes. •	Online media owners who help us target, deliver and track our marketing campaigns using cookies. Of the data we process outside of any contract we retain the data for no longer than is necessary. Where there is a legal requirement to retain data for longer than Rennies Coaches requires, we will do so. Where reasonably practicable data is minimised so not to be identifiable to the data subject unless required by law or is subject to a Subject Access Request.